Mon., March 19, 2018, 10:09 a.m. But even that’s probably underselling it. A memorable, zany first two rounds – even by March Madness standards – set up what could be another wild two weekends in a tournament where anything can become reality. It’s turned into a nutty, once-in-a-generation kind of ride. The UMBC Retrievers became the first No. 16 seed in the history of the men’s tournament to beat a No. 1 seed, defeating Virginia in the first round Friday night. The Retrievers’ run came to an end on Sunday night in a 50-43 loss to ninth-seeded Kansas State, but not before tattooing a lasting imprint on American sports, drawing attention from stars of the NFL, NBA and Twitch – and love from underdogs everywhere. “We put our name on the map. We (gave) hope to teams that come to the tournament with lower seeds,” guard K.J. Maura said. UMBC’s success story contributed to the messy, unprecedentedly jumbled bracket in the South Region, where the highest-remaining seed is No. 5 Kentucky. It’s the first time in tourney history that a regional semifinal will be held without a top 4 seed, according to the NCAA. “That locker room right now, I’ve never seen anything like it in my life. It’s the happiest I’ve ever seen. 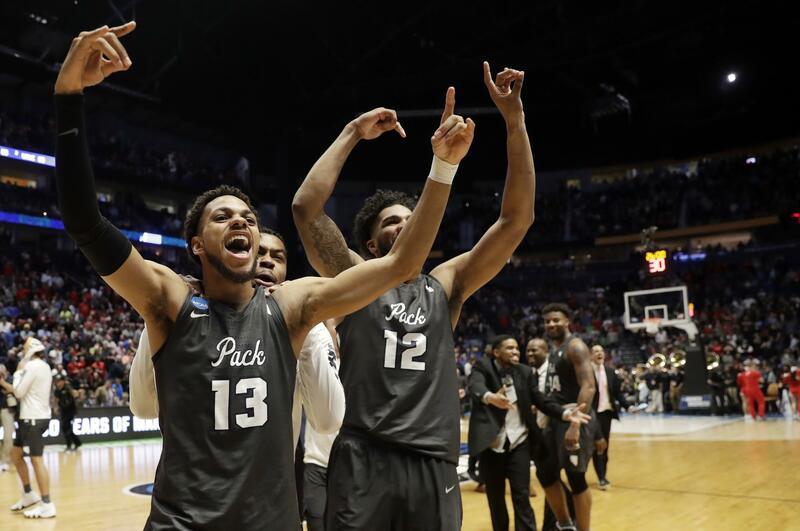 It’s the happiest I’ve ever been in my life,” Wolf Pack coach Eric Musselman said. It was also the second straight year the titleholder lost before the Sweet 16. And it happened in UNC-friendly territory in Charlotte, North Carolina, where the Tar Heels hadn’t lost a tourney game since 1979. Who’s left: A look at the teams and matchups for the Sweet 16 by region. Call it a comeback: Nevada’s comeback from a 22-point deficit matched Duke’s rally after beating Maryland in the 2001 Final Four. The biggest comeback belongs to BYU, which trailed by 25 points before beating Iona in the 2012 First Four. The top four seeds – No. 1 Virginia, No. 2 Cincinnati, No. 3 Tennessee and No. 4 Arizona are all done. Spoiled home cookin’: Don’t invite Texas A&M and Syracuse to homecoming parties. In Detroit, Syracuse tuned out the noise from a Michigan State-partisan crowd for a 55-53 win . The Orange’s trademark 2-3 zone gave another unfamiliar opponent fits after holding the more talented Spartans to 26 percent shooting. Two ones are done: Two No. 1 seeds didn’t make it out of the tournament’s opening weekend for the first time since 2004, when Stanford and Kentucky both lost in the second round. Published: March 19, 2018, 10:09 a.m.